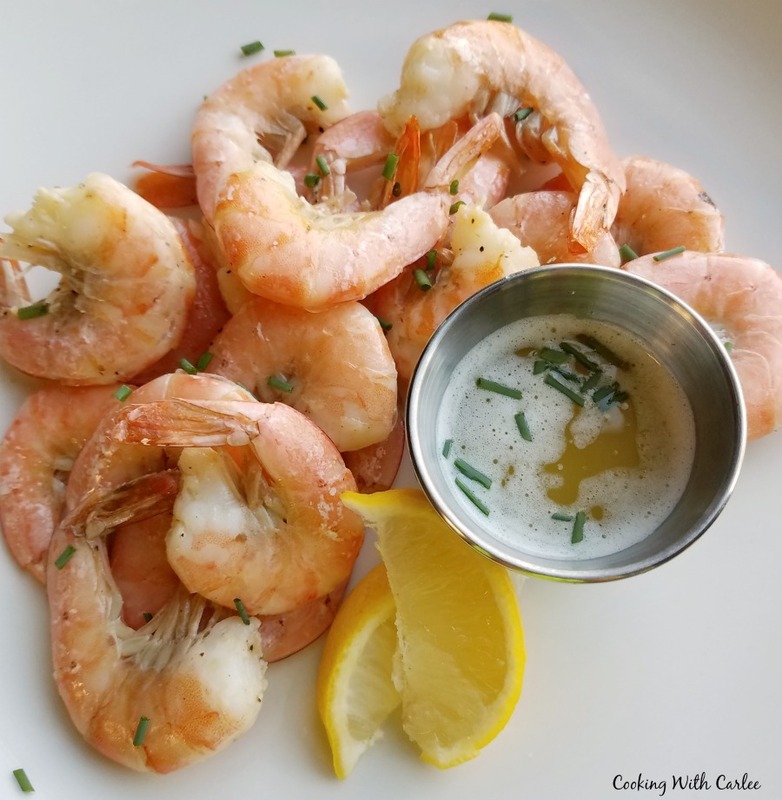 This roasted shrimp is kissed with the citrusy goodness of key lime juice. Dip them into lime butter for an extra special treat. They are like taking a bite of Florida. After a few years of mild hurricane seasons (I say typing a comfortable 12 hour drive from any hurricane zone,) this one came out of the gate with a vengeance. As my blogger friends and I were trying to figure out a way to show our support to those affected by Hurricane Harvey, the news of Irma started rolling in. While Irma may sound like a sweet old lady who might bake you cookies and pinch your cheeks, this storm seemed to have other things in mind. She was big. She was angry. She had her sights set on Florida. So as we were quickly creating Texas themed recipes to share our friends amd family in Florida were putting up the storm shutters and packing up their favorite belongings to evacuate. With nerves already shot from the pictures of what happened in Texas and anxiety high, whole parts of the state were moving to higher ground. Luckily Irma did lose a bit of steam and temper as she hit Florida, it was too little too late for the Islands in the Atlantic and the southern part of the state. Even those that weren't hit directly likely had to deal with power outages and some wind damage. One of my closest blogging friends, Ellen from Family Around the Table was anxiously awaiting news from home as they made the best of a tense situation. Being evacuated from your home in the face of a big storm may be the safer decision, but that doesn't make it an easy one. So of course we immediately sprung into action. We wanted to show our support to all of those affected by Irma as well. My first instinct was to go to one of my favorite Florida flavors, creamsicle. I have talked about the childhood vacation memories that flavor combination reminds me of when I posted the Orange Creamsicle No-Bake Cheesecake and creamsicle sourdough muffins. I was tempted to dream up some new creamsicle creation, but finally decided to do something savory instead. 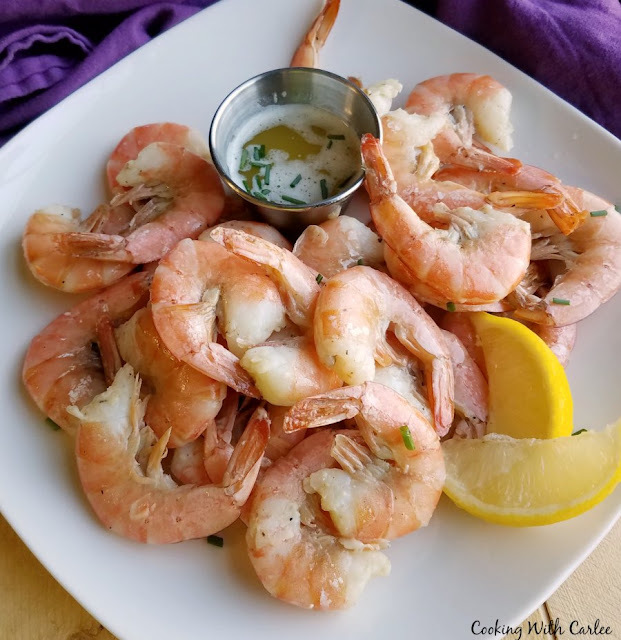 We loved the shrimp and lime combination from my Texas recipe so much, I decided to use them again in this tribute recipe. Of course this time I used key lime juice instead. 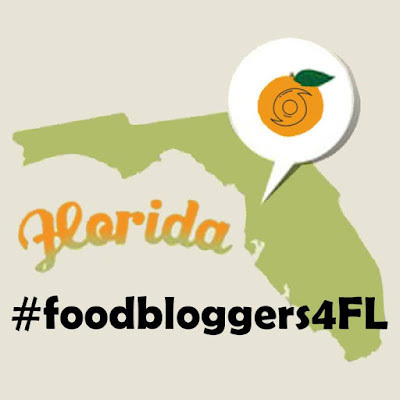 I thought the more floral and totally iconic Florida citrus would be a perfect marinade for shrimp. Add a little key lime butter for a finger licking experience. Of course I still had to serve cocktail sauce for Little Dude. "Shrimp and sauce" is one of his favorite foods. Of course a slice of no bake key lime pie would be a great way to end the meal. We love that recipe because you don't use cool whip. It's almost like a super creamy no bake cheesecake. Preheat oven to 400 F and spray two rimmed baking sheet pans. Toss the shrimp in olive oil, key lime juice and a generous sprinkling of salt and pepper. Let sit for about 5 minutes. Spread shrimp over prepared pans. Cook for 5-8 minutes or until pink. Be careful not to overcook them. Serve warm or place in the refrigerator to serve as cold shrimp cocktail. Peel shrimp, dip and enjoy! Yum. I like shrimp with lemon. Bet I would love ❤️ ❤️❤️❤️❤️this! It is a really nice slight variation on the classic combination! My husband looked at me crosseyed when he saw it as he is a cocktail sauce lover. But once he tried it his cocktail sauce went untouched and the key lime butter disappeared! This looks so yummy! 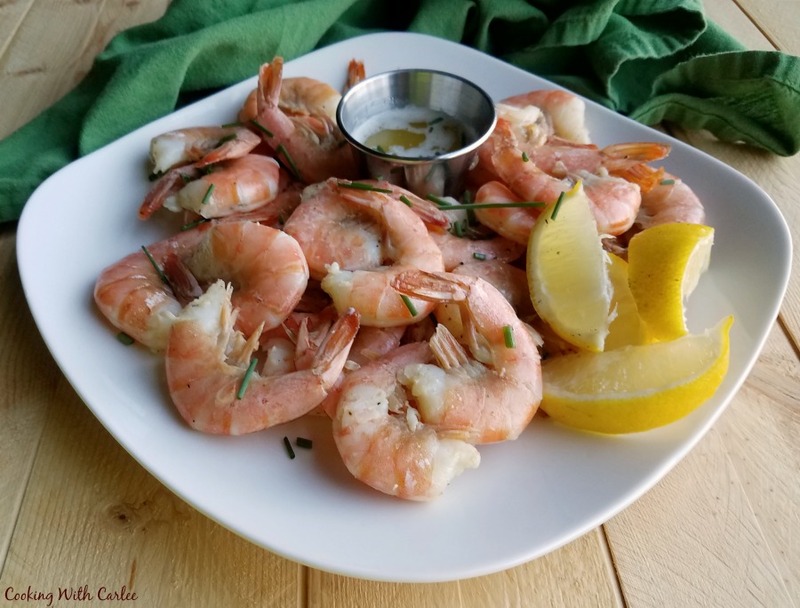 We all love shrimp and I can't wait to make it with my fresh Key lime juice! Thank you for the shout out! I am so jealous of your tree! I hope you love this! I'll bet this was perfect with the key limes as well. Thanks for supporting our friends and family struck by these terrible tragedies. I wish I had some key limes for a fresh squeeze at the end, but I only had access to the juice in a bottle! Love this idea! The key lime butter sounds perfect! Man, oh man, do these sound good! Wish I was having these tonight! By the way, your description of Irma being someone to bake cookies with gave me a good chuckle. Very true. These do sound like a bite of Florida! It really makes them! Little Dude still wanted cocktail sauce, "shrimp and sauce" is one of his favorite foods, but my husband and I couldn't stay out of the lime butter!